Chinese actresses, Yao Chen (姚晨) and Chen Ran (陈燃) attended 'Search (搜索)' press conference held in Ningbo, China on October 18, 2011. Yao Chen (姚晨) wore a blue sand-washed crepe dress from Lanvin Fall/Winter 2011 collection. Opting out the jewelry seen on the runway, she kept her look simple with a pair of Charlotte Olympia Doleres platform pump. 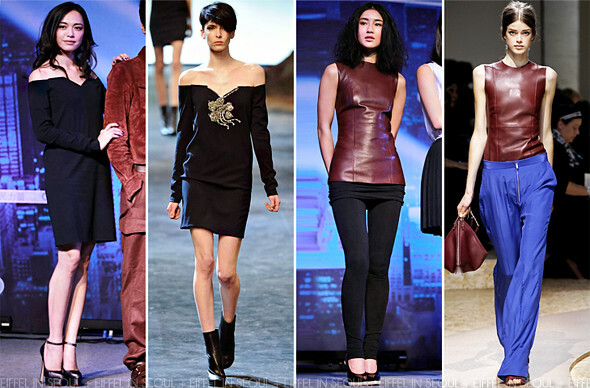 Chen Ran (陈燃) on the other hand opted for a brown leather top from Céline Spring/Summer 2011 collection. Styled with a skirt/tight combo and a pair of black pumps. Yao Chen (姚晨) looks great but I would love to see it with the jewelry piece seen on the runway. Didn't like Chen Ran (陈燃) bottoms too much, it looks weird but her hair added a little drama to her look which I love.